Google Reader may not be much to look at, but it puts all your favorite sites and blogs under one convenient roof. Do you routinely hop from one favorite Web site to another, just to see if anything new's been added? There's a faster, easier way: an RSS reader. Though it sounds like something you'd find on a loan form, like Regulatory Savings Stipend, it's actually a huge timesaver. RSS stands for Really Simple Syndication, a technology that enables sites to come to you instead of you having to go to them. Here's how it works: When you visit a news site, blog, or some other Web page you like, you "subscribe" to it--usually by clicking a specially marked icon somewhere on the page. Once you've subscribed, new content from that site is automatically fed to your RSS reader (sometimes known as an "aggregator"), which can be either a special program or a Web service. Ultimately, the goal is to see news and new posts under one roof instead of jumping from site to site to site. Once you're signed in, there are two ways to add feeds: manually, by clicking "Add subscription," or automatically, by clicking the "Add to Google" button or RSS icon on a site you want to subscribe to. Give it a try, then meet me back here tomorrow for some tips on making the most of it. You won't be disappointed. 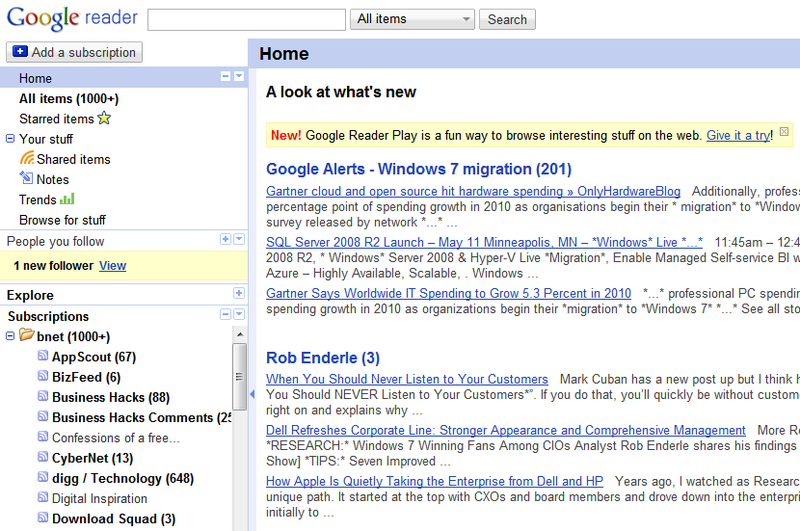 In the meantime, anyone already familiar with Google Reader should check out Outlook Tip: View Your Google Reader Feeds.